Joe Brooks knows that a picture is worth a thousand words. 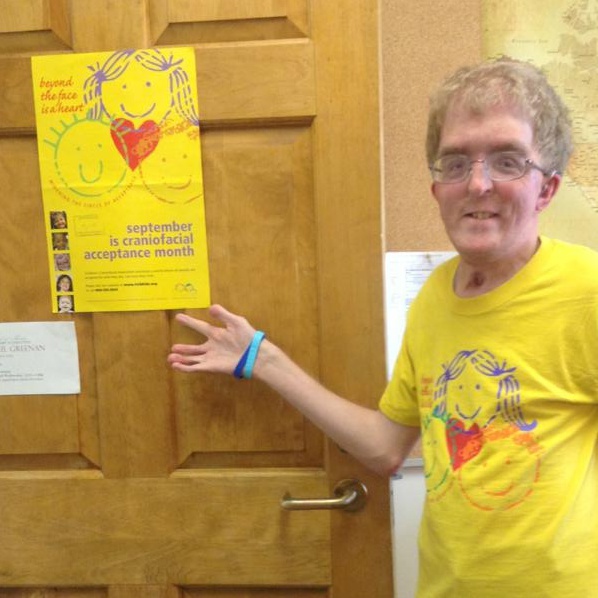 In this post, he shows us how to turn Facebook yellow to celebrate Craniofacial Awareness Month (#CAM). Thank you, Joe for your great instructions on how to update your Facebook page images. Everyone should do the same on Twitter and Instagram, too. On Twitter, be sure to tag your #CAM posts with this year's hashtag, #CAM2017. Every word and image makes a big difference. Take it away, Joe! September is Craniofacial Acceptance Month. During that month, I, along with my friends, aim to raise awareness and let the general public know that people with craniofacial syndromes are, well…people. Just like them. We all have likes and dislikes and we can be goofy and all that good stuff. Children’s Craniofacial Association is a nonprofit headquartered in Dallas that serves people and families affected by craniofacial differences. Every September, we encourage as many people as possible to change their Facebook profile pictures and/or cover photos to the CAM graphics. Since I know that there are people that want to do this but don’t know how to use Facebook very well, or are not sure how to change their pictures, I have decided to write up some instructions to explain how it’s done. Feel free to pass it on to anyone who needs help. Click that and a menu will pop up. Find the “Upload Photo” option at the top, and then upload it from your computer. You can download the CAM graphic from this blog post below. If that doesn’t work, download from the CCA website, or from one of your Facebook friends who already has it. How to download and save: Just right click the image and “save image as” to save to your computer; it will most likely save to your "Downloads" folder on your computer, unless you select another folder (like your Desktop). If you already made the Children's Craniofacial Association logo your profile pic in the past, you do NOT need to re-upload it. All you need to do is select “Choose from Photos” from that same menu that pops up when you hover over your current profile picture. Then, you have the option to scroll through your photos. Find that yellow graphic that you used before. Facebook will ask you if you want to re-use that picture….lol….just click "YES" and there you go! Part 3 - For cover photos the process is similar. There is a faint camera icon on the top left corner of your current cover photo. Click on it and a similar menu will appear, follow the same profile picture steps for your cover photo. So there you have it. Now you too can help spread the Acceptance message with us all month. And don't forget to apply this year's new hashtag #DifferentIsCool_CAM2016 to your social media posts.